We’re about one month away from Think Summit, and we’re laser-focused on making sure every attendee leaves empowered and inspired (experiences are kind of our thing). We’re ditching jargon and buzzwords for two days of thought-provoking keynotes, actionable content, and interactive sessions. If you’ve joined us at previous Think Summits, you get it. But if you’re still on the fence (or still need to convince your boss), here are 5 reasons why you don’t want to miss out on this year’s event. 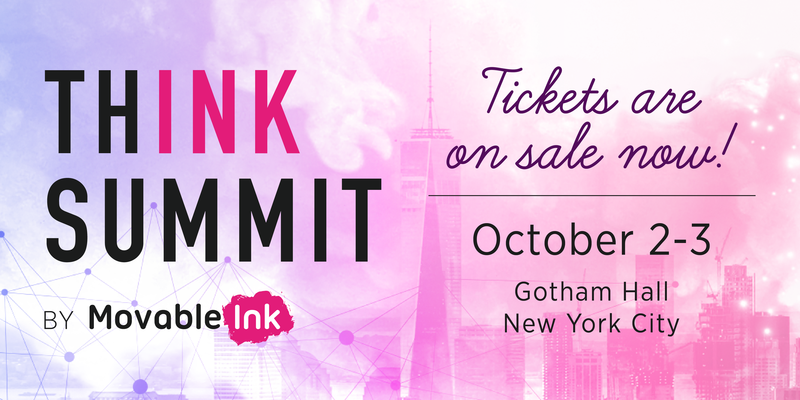 This year’s Think Summit is in New York City’s own Gotham Hall, a renovated 1920’s bank with all of the extravagance of Gilded Age architecture. If there’s one thing we know about New York, it’s that no two days are ever the same. Your experience here shouldn’t be one size fits all either. You’re going to have a great time visiting the city and experiencing the best of what it has to offer. And fellow jaded New Yorkers: don’t worry. We have some fun things planned for you too. We know how to shake things up and keep your day interesting in between those all-important strategy sessions and keynotes. There are interactive sessions and plenty of surprises planned throughout the event. We’re keeping them a secret for now, but know that they made our Instagram-obsessed marketers celebrate. Wondering how you can elevate your non-profit’s emails? Or do you have to revamp an existing campaign? You’ll get to hear from industry leaders and Movable Ink power users who will give you their best advice on data integrations, email marketing, and more. We have speakers from Hilton, Verizon, PayPal, and much more. We’ll have plenty of opportunities for you to learn everything you want to know about Movable Ink. You can check out our product lounge for detailed demos, product training, and opportunities to discuss your biggest strategic challenges with an expert Inker. What’s a conference without a headliner? We won’t give anything away, but you’re not going to want to miss our CEO, Vivek Sharma’s keynote presentation. Think Summit isn’t your typical conference. You’ll walk away with actionable tips from digital marketing experts, dive deep into the Movable Ink platform, and be among the first to learn about our big announcement. You can get your Think Summit tickets here. Already have tickets? Tweet us about what you’re looking forward to the most with hashtag #ThinkSummit! This entry was posted in Events, Think Summit and tagged email marketing conference, marketing conferences, movable ink conference, thinksummit, think summit, think summit 2018 on September 24, 2018 by Carine Alexis.